Identification of Mutant Genes and Introgressed Tiger Salamander DNA in the Laboratory Axolotl, Ambystoma mexicanum. Title Identification of Mutant Genes and Introgressed Tiger Salamander DNA in the Laboratory Axolotl, Ambystoma mexicanum. 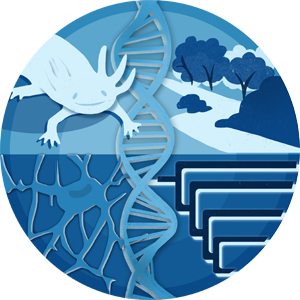 The molecular genetic toolkit of the Mexican axolotl, a classic model organism, has matured to the point where it is now possible to identify genes for mutant phenotypes. We used a positional cloning-candidate gene approach to identify molecular bases for two historic axolotl pigment phenotypes: white and albino. White (d/d) mutants have defects in pigment cell morphogenesis and differentiation, whereas albino (a/a) mutants lack melanin. We identified in white mutants a transcriptional defect in endothelin 3 (edn3), encoding a peptide factor that promotes pigment cell migration and differentiation in other vertebrates. Transgenic restoration of Edn3 expression rescued the homozygous white mutant phenotype. We mapped the albino locus to tyrosinase (tyr) and identified polymorphisms shared between the albino allele (tyr ) and tyr alleles in a Minnesota population of tiger salamanders from which the albino trait was introgressed. tyr has a 142 bp deletion and similar engineered alleles recapitulated the albino phenotype. Finally, we show that historical introgression of tyr significantly altered genomic composition of the laboratory axolotl, yielding a distinct, hybrid strain of ambystomatid salamander. Our results demonstrate the feasibility of identifying genes for traits in the laboratory Mexican axolotl.